Keywords: Breast; myoepithelioma; fine needle aspiration. Myoepithelioma/adenomyoepithelioma is a rare salivary gland tumor arising from proliferation of myoepithelial cells. These tumors represent 1%-1.5% of all salivary gland tumors, and are distributed 48% in parotids, 42% in the small salivary glands and the remaining in glandula submandibularis and seromucous glands of the nose and larynx. Other localizations reported are the skin, breast, chest, lung and pancreas. , Incidence of myoepithelioma in breast could not be ascertained due rarity of the lesion and paucity of literature on the subject with few case reports. Here, we present a case of myoepithelioma of breast diagnosed on cytopathology. A 20-year-old female presented to us with slowly growing breast lump for last 1 year, localized in upper outer quadrant. The lump was well defined, freely mobile and measured 3 × 3 cm in greatest dimension. The overlying skin was unremarkable. Axillary palpation was negative for lymph nodes. Fine needle aspiration was performed. The cytological findings revealed cell rich smears comprising monomorphic loosely cohesive sheets of plasmacytoid cells, round to polygonal cells with round to ovoid eccentrically placed nuclei, finely dispersed chromatin, and moderate amount of cytoplasm. Overall findings suggested myoepithelioma, breast - plasmacytoid type [Figure 1]. On the basis of above findings lumpectomy was done and the tissue was sent for histopathological examination. Grossly, the tissue was well circumscribed greyish white measuring 3 × 3 cm. Microscopic examination revealed tumor cells arranged in sheets with abundant myxoid stroma. The individual cells were round to polygonal, having prominent eosinophillic cytoplasm and eccentrically placed round nuclei. The diagnosis of myoepithelioma, plasmacytoid type was made on the basis of the above findings. On immunohistochemistry cells were positive for S-100 protein and actin. Myoepithelioma of the breast is a very rare tumor, originating from the myoepithelial cells of normal duct lining of breast. The two cells types, epithelial and myoepithelial are found in the linings. The epithelial cell layer, which is right next to the open space or lumen of the duct, largely has a secretary function. The myoepithelial cells are further back, away from the lumen and are attached to the basement membrane. Pure spindle cell myoepithelial tumors may resemble spindle cell carcinoma when the tumor cells are large and pleomorphic, leiomyoma, or fibromatosis if cells are small and regular. Distinction from leiomyoma rests on identification of epithelial lined luminal spaces. Fibromatosis has a characteristically infiltrative pattern with uniform spindle cells and interlacing fascicles. Pure spindle cell myoepithelioma cells are usually larger and less uniform than those seen in fibromatosis. 1. Koenigsberg RA, Vakil N, Noronha B. Undifferentiated metastatic carcinoma and myoepithelioma: two rare causes of hypervascular masses of the parapharyngeal space. Ear Nose Throat J 2007;86:402-5. 2. Darvishian F, Lin O. Myoepithelial cell-rich neoplasms: Cytologic features of benign and malignant lesions. Cancer 2004;102:355-61. 3. Ellis IO, Pinder SE, Lee AH. Tumours of the breast. In: Fletcher CD, editor. Diagnostic histopathology of tumours, 3 rd ed. Philadelphia: Churchill Livingstone; 2007. p. 951-2. 4. Martínez-Madrigal F, Santiago Payán H, Meneses A, Domínguez Malagón H, Rojas ME. Plasmacytoid myoepithelioma of the laryngeal region: A case report. Hum Pathol 1995;26:802-4. 5. Cuadra Zelaya F, Quezada Rivera D, Tapia Vazquez JL, Paez Valencia C, Gaitán Cepeda LA. 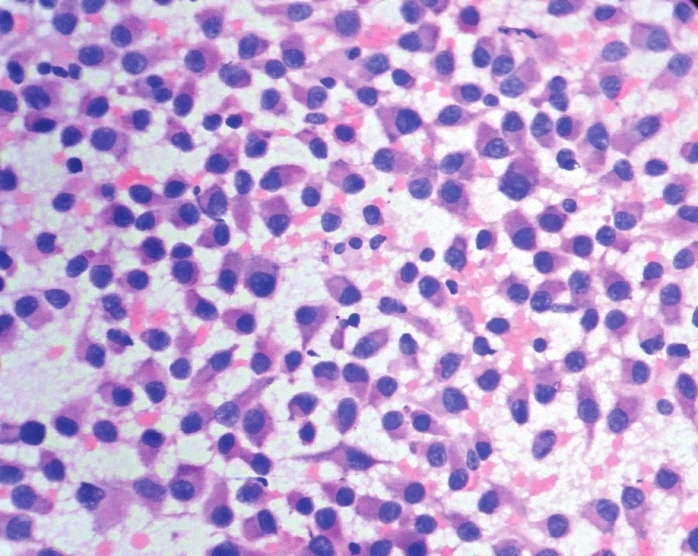 Plasmacytoid myoepithelioma of the palate. Report of one case and review of the literature. Med Oral Patol Oral Cir Bucal 2007;12:E552-5. 6. Dardick I, Thomas MJ, Van Nostrand AW. Myoepithelioma-new concepts of histology and classification: a light and electron microscopic study. Ultrastruct Pathol 1989;13:187-224. 7. Ibrahim R, Bird DJ, Sieler MW. Malignant myoepithelioma of the larynx with massive metastatic spread to the liver: An ultrastructural and immunocytochemical study. Ultrastruct Pathol 1991;15:69-76. 8. Tavassoli FA. Myoepithelial lesions of the breast. Myoepitheliosis, adenomyoepithelioma, and myoepithelial carcinoma. Am J Surg Pathol 1991;15:554-68. 9. Dardick I. Myoepithelioma: Definitions and diagnostic criteria. Ultrastruct Pathol 1995;19:335-45. 10. Ellis GL, Auclair PL. Tumors of the salivary gland, Atlas of pathology. 3rd series. Fascicle 17, Washington DC: AFIP; 1996. p. 80-94. Breast; myoepithelioma; fine needle aspiration.